Pictures have emerged of the scene of a fatal road traffic incident near to Londonderry. A man died in the collision at Bridgend, just to the west of the Donegal-Londonderry border, on the outskirts of Londonderry city itself. Gardai are investigating the fatal collision, which occurred at 11.55pm on Saturday. A silver Opel Omega car was in collision with two pedestrians. 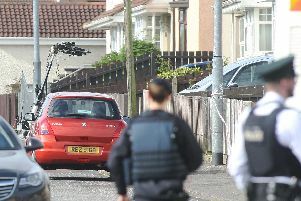 It is believed that the car was travelling from the Londonderry direction towards Bridgend prior to the collision. One pedestrian, thought to be a man in his 20s or 30s, was later pronounced dead at Altnagelvin Hospital. The second pedestrian was not seriously injured. The driver of the car was arrested at the scene on suspicion of dangerous driving and is detained at Buncrana Garda Station. Gardai are appealing for witnesses to the incident to contact them at Buncrana Garda Station on (00353)74 9320540. Gardai are, in particularly, appealing to a couple who flagged down a Garda patrol car at a filling station in Bridgend and reported the crash, to make contact with Buncrana Garda Station.